About 6 minutes and 29 seconds reading time for this 1.8K word page. A Facebook.Com Group called Restore LA Program Info Exchange offers Disaster Victims in any state help with navigation by personal experience and published laws, rules and guidance your OCD-DRU CDBG-DR grantee programs. To provide a force behind a movement we need specific approaches. I have noticed that those that took the SBA loan have inadvertently added financial hardship on their household. What you thought was a good thing for your household may now be costing you thousands of dollars out of pocket. While we could argue "Texas, Florida, California, Puerto Rico, don't have the SBA loan listed as DOB so why do we?". I see that movement running out of steam in 30 seconds. It isn't the approach for any politician / lawyer. They (House Reps) are not going to amend anything with a “Jealously” approach. Think about what you want Congressman Graves to read from us on C-SPAN and on the floor of the house, Live.House.Gov. We need to focus on what the true issue is and that's Money out of pocket. For some reason most of us were not told this would come back to hurt us financially down the rebuilding path. 1. Collect the total number of members that accepted the SBA loan. Political arguments need to show victims, but also need to show very little ripple affect toward budgets / salaries that our politicians have made or nothing will ever be done. If you listened to the 6 (or was it 8) hours of Nancy Pelosi California's 12th District pelosi.house.gov you would know that having a person read letter by letter from possible victims of deportation is a perfect political shot. She read scripted letters that expressed how well the illegals were doing and how they can help our country grow by not being deported for what the parents did. In our case we have Congressman Garrett Graves, Louisiana 6th District Garret Graves.house.gov We need to hand him letters from everyone with an SBA loan and you need to share with us your financial hardship story during the flood and after the flood. Share with congress what your rebuilding efforts felt like and how you were sold on the idea that an SBA loan secured by FEMA was a good idea. With the SBA financial hardship combined with the DOB which places more financial hardship on your household, you are experiencing near total family bankruptcy or financial suffering. Each letter from everyone with a SBA Loan needs to be read into record. Reading time seems to be less than 3 minutes per letter. We need you to plead our case. As a group, SBA or not, we need to get the word out that we are going to fill Congressman Graves hands with letters from each of you. Post your SBA Loan amount below, and I'll update the list here. Start your letter here so as a group we can fine tune our American English Language to be understood by politicians. Politics: Here is the section that clearly states the SBA - DOB issue this is what was signed by POTUS. Notes and comments posted to different Facebook groups and people looking for assistance related to the issue of SBA Loans that were declined by any person. 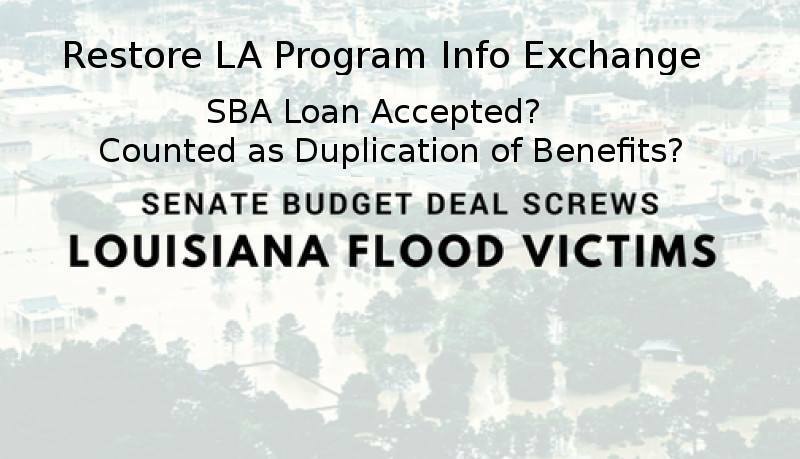 Recap: Restore and the Office of Community Development Disaster Recovery Unit of Louisiana are using what seems to be a formula to deny a homeowner CDBG-DR Grants due to the fact that they have credit. 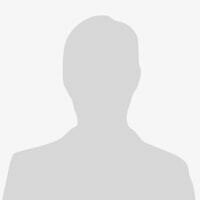 The homeowner can be Low to Moderate Income and still denied by Restore IEM Inc. The issue has officially been recognized by Congressman Graves FB page. HUD has updated it's policy, see the link to the HUD website posting Public Law 115-123 our "If declined SBA Loan" is in that law. HUD has also updated their Training manual that is required training for Louisiana OCD yearly to reflect this same law. You can see that information on their HUD Exchange Info website under CDBG-DR training. In the HUDOIG.Gov 2017 KS report they clearly point out that no matter what HUD actually says States OCD will do as they please. This is the real issue. The current director of Restore Mr. Patrick Forbes also directed the Katrina Road Home. It took this person 8 years to ask HUD for guidance on the most basic of things. You can read this in the APA 59 published in July 2013 to HUD just as our OCD-DRU publishes APA 1-6 in our disaster page. So much is repeated and so much is ignored. If you look closely it appears they are redirecting money from one program and creating new programs while the Homeowners Assistance program managed by IEM Inc with our resource person Jeff Haley in the middle who also worked Katrina are not focused on our real issues or should I say they are not focused on issues that could help 2,000 or 3,000 when they can delay the recovery by focusing on something that they claim will help 10,000. It's a load of river mud if you ask me. Take a slice of a pie (3,000 people), not the whole pie (10,000) and start eating it one bite at a time (1 household). It's a new concept to many not to shove your whole face into the pie I guess. It appears no matter what laws are sign by the @POTUS they are not HUD directives so the local states Office of Community Development doesn't have to follow the new law. In the words from our OCD-DRU, (paraphasing) If HUD does not provide a Directive and Guidance on that Directive we do not have to change our methods. We do believe the state is still denying homeowners grants due to SBA Loans even if they were declined. The new Law clearly states if declined it should not count against the homeowner. But the HUD version, if it's proven to be a hardship then at that point it will be removed. Most people that were approved the first round by SBA had good credit even if they where low to moderate incomes. Restore has not compared expense to income. They only take if a homeowner was approved the loan. HUD updated it's online training and have published the Federal Register notice in the HUD website. This still does not force any state level Grantee (OCD-DRU) directed by Mr. Patrick Forbes to do anything. HUD has only issued guidance on this issue since 2011 to which our state has ignored this specific guidance and the spirit it was writen in. The state of Louisiana has adapt what seems to be a policy of denying homeowners based on Credit Worthiness and not Income. A low to moderate income household with good credit and approved an SBA Loan in the first round seems to be denied a "Financial Hardship" by Restore (OCD-DRU). The Administrative Manual 3.8 which the OCD-DRU uses implies if they (OCDDRU) feel the household can based on income handle the debt of of an SBA Loan they will deny the financial hardship appeal. The OCD-DRU does this without comparing the household expenses, they only take the adjusted gross income from one of the tax seasons they choose between 2015 and 2017. Basically Congress and Senate can make new rules daily that do nothing. Until HUD issues a directive regarding one of these rules and then issues clear guidance on how to implement this new rules the states which include every state that has had a disaster does not have to abide by the rule of law. You can check Texas, Puerto Rico, Florida for the same issues we are having. Read the HUD OIG reports regarding the issue. In my opinion, without the states actually doing something at ground level this issue will not be resolved in our lifetime. Congressman Garret Graves with all due respect, can you say if the SBA Loan is no longer counted as Duplication of Benefits will this allow households to apply for Restore LA Grants (CDBG-DR HUD)? If so, will you create a law that blocks the SBA from collecting down stream any grants the SBA deems as a duplication of benefits? Example Katrina, SBA claimed CDBG-DR grant awards as DOB and collected the money from the HUD program Road Home and used that money to pay down the SBA Loan debt of the homeowner. This caused a short fall of funds for LMI road home program households to which more than one year later additional money had to be requested to continue the program. As it stands now, the SBA contract terms clearly state that any Insurance, Federal Grants awarded after the SBA Loan has been taken in part or whole will be used to pay back the SBA loan or pay down the SBA loan. If that is the case then we need also to modify the wording in the Stafford Act to allow Federal Grant money to be used to pay down or pay offer Federal Secured Loans. The current bill references loans but does not specifically say what type of loan, SBA Loans are Federally Secured which according to the Stafford Act are not to be paid for by other federal money. The last hurdle to this easy process is to identify the unmet needs that the households with SBA Loans have so they qualify for Restore LA Funds (CDBG-DR). 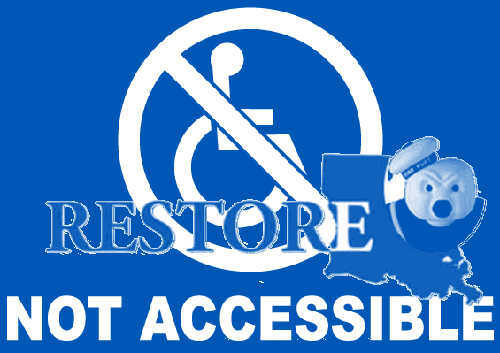 Currently the Restore Group is not focused on unmet needs as much as collecting duplication of benefits. Also by using economy grade estimates most all of your homeowners that took the SBA loans will not have any measurable unmet needs thus not allowing for any Restore LA Grant Awards.